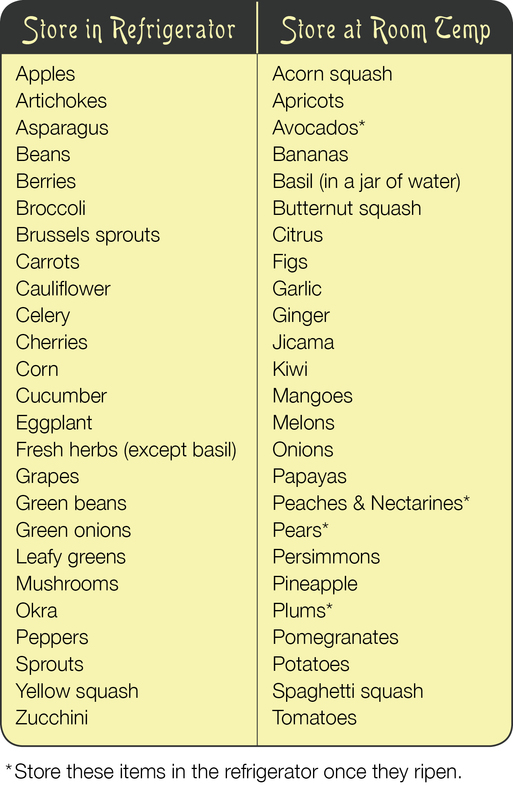 One of the biggest kitchen blunders I see is the improper storage of fruits and veggies. I frequently see tomatoes in the refrigerator and apples on the counter. These are big no-nos! Refrigeration is the enemy of tomatoes. It not only changes the flavor, but it turns the flesh mealy. By not storing your fruits and veggies correctly you are impacting their flavor, texture, and color. They also may not be lasting as long as they could. I have compiled this little cheat sheet to help eliminate the guesswork. Feel free to print this out and hang it on the refrigerator or inside one of the kitchen cabinets. Hopefully, by properly storing your produce it will last longer and you will be tossing out less at the end of each week. Happy eating!